This recipe is a labour of love that takes time but is well worth it. Do make it with a fine big piece of brisket so that you get the most out of your efforts. Brining the meat makes it very moist and juicy. First make the brine. Place all the ingredients in a saucepan over a high heat and stir while bringing to the boil. Remove from the heat and stir until the sugar and salt are completely dissolved. Leave to cool. Place the brisket in the brine for a couple of hours, choosing a container that allows you to submerge the meat completely. Make the dry rub by combining all the ingredients. Remove the brisket from the brine and pat dry with kitchen paper. Smear the surface of the brisket with yellow mustard. Then sprinkle all over with the dry rub. If you have a stove-top smoker, put in the brisket for about an hour over medium heat, checking it every so often to make sure that the meat does not burn. This step is optional — there’s no need to rush out and buy a smoker — it just adds an extra dimension. Make the barbecue sauce by putting all the ingredients into a large pot over high heat. Bring to the boil, reduce the heat and simmer for about 1 hour and 15 minutes or until the consistency is sauce-like. Remove the bay leaves and lemon and blend with a hand blender. Preheat the oven to 130˚ C/fan 110˚ C/gas mark 1. Place the brisket in a roasting tray and cover with a layer of clingfilm and two layers of tinfoil. Cook in the preheated oven for approximately five hours, or until very tender. 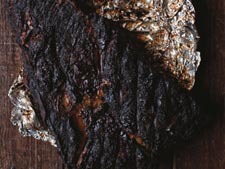 To char the outside, either finish the brisket on the barbecue or in the oven with the foil off until it is nicely browned and the fat is crisp. When the brisket is cool enough to handle, extract the meat, the crisp fat and the outer bark from the surface, discarding any excess visible fat. Combine with the barbecue sauce, warm gently, and serve with red slaw and sweet potato wedges.